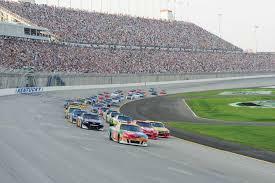 The annual racing weekend at Sparta’s Kentucky Speedway will feature traffic flow on and off the race track. It’s the moving of vehicles off track which has the attention of police and parking officials. It’s been five years since the first NASCAR Sprint Cup race at the northern Kentucky track. That inaugural event found major traffic and parking problems causing many headaches. Highway access and parking improvements followed. Still State Police Trooper Josh Lawson says signage, traffic apps, and officers are all important keys to a smooth event. “We’ve increased the amount of signage, warnings, press releases, things that we’re putting out that can be pre-emptive to try to decrease the amount of traffic who is not intentionally coming here to the race. They are just passing through,” said Lawson.